The Mieso-Dire Dawa–Dewanle railway project was redefined by the commencement of a new phase where new tracks were laid in Dire Dawa, Ethiopia, on May 8, 2014. The construction of the railway is a key component of the GTP: a series of eight rail corridors totaling 4,744 kilometers, creating a series of key trade routes to neighboring Kenya, South Sudan, Sudan and finally to Djibouti’s port. The project is expected to be completed by 2015 and will cover 740 kilometers and it will link Addis Ababa to Djibouti’s capital city, Djibouti. The Addis-Djibouti railway will enable Ethiopia easy access to the port of Djibouti providing both passenger and freight service transporting 3,500 tons of goods at a time. 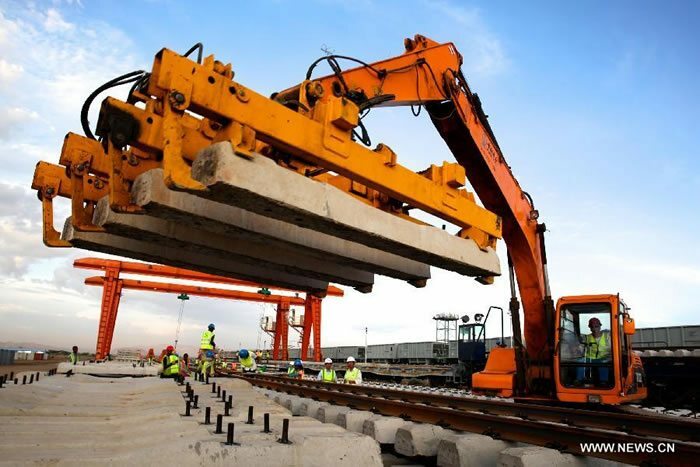 The general manager of China Civil Engineering Construction Corporation, Yuan Li, said that the track-laying marks an important construction stage of the Ethiopia-Djibouti railway. When completed the Addis-Djibouti electrified railway, a priority project within the GTP, is expected to reduce the travel time from Addis Ababa to Djibouti by half to less than ten hours with a designated speed of 120km/hour. The project generally seeks to boost Ethiopia’s commercial exports and also symbolize a shift in Ethiopia`s international relations.